660: Puncturing Prospecting Myths & Is the SDR model working? Mike Schultz, Mike Schultz President of RAIN Group and Bridget Gleason, VP of Sales for Logz.io and my regular partner, join me on this episode of #Accelerate! RAIN Group has full-time offices around the world, augmented by representatives in cities around the U.S. and one each in Germany and Dubai. Mike sees the same challenges and hurdles in B2B sales everywhere. There are problems specific to each nation, but selling is selling, wherever the customer is found. 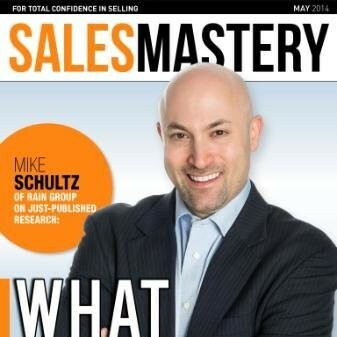 RAIN Group’s report, “5 Sales Prospecting Myths Debunked,” gets to the facts about sales. RAIN Group surveyed 488 buyers from 25 industries with $4.6 billion in purchasing power and 489 sellers across 26 industries. Most buyers want to speak with a seller when they are looking for new ideas or solutions. Sellers largely do not approach buyers with relevance. 58% of CEOs surveyed said they do not find value in speaking to a salesperson. When a buyer invests time with you, give something of value to them or there will be no next meeting. It takes up to 10 minutes for a CEO to decide if you are worth putting on their list. Ask CEOs what would be worth their time. Don’t hide behind social media to get in touch with your market. Do your outreach. Cold calling is not dead. Buyers prefer outreach by email (1st choice) or phone call (2nd choice) out of all methods. Customized email is powerful. 82% of CEOs will take a meeting with sellers they don’t know, at least sometime each year. Research their industry, company, and the CEO before reaching out, so they know that you know who they are. In prospecting, by doing the right things you can increase your averages. Research is not to lean on, but for illumination. Don’t rely on technology to get meetings. It’s not how many outreaches, but how many high-quality outreaches, that get you good meetings. More calls may mean more low-quality meetings resulting in lower sales and higher turnover. Experiment with your process. Buyers do want to know your capabilities and product features. Your discovery questions need to accompany information for them. Ask them what they want to know. Answer their questions as they answer yours. Content is a relatively new factor in prospecting. Prospecting has been part of sales for decades; content can be an added value. But don’t try to be a thought leader if you are worse at blogging than at prospecting. People of the cell phone generation do not know how to stay focused. Put your phone away while you work. Provide value to your customers and prospects so they know you are worth meeting. Call them. Andy recalls a conversation with a VP of Sales at a high-growth SaaS startup. He brings up some thoughts. The SDR model is not working for them. Attending events is a new way for them to explore lead generation. This company wins 50% of the deals they conduct at the CEO level and loses 100% of the deals where they do not get to talk to the CEO. Two-thirds of their reps hit quota. Andy invites Bridget as a VP to share insights. SDRs have a high turnover. It’s a hard position without a career path. Does it belong to Sales or Marketing or is it shared? Bridget involves the SDRs in events and in ABM. Bridget wants SDRs to grow into other positions. Should you organize your own events and invite the right level of people? Andy gives a case study. Bridget uses them to good effect. People used to attend trade shows to discover. Now they attend specifically to meet with vendor representatives A, B, and C.
Bridget defends the SDR role. Andy wants to put SDRs into Marketing Lead Gen. Bridget is happy for it to be there. It is a shared resource. Keep Marketing and Sales aligned with each other on messaging and targets. What about the VP of Sales position? Andy sees it as an enduring role.